Summary	 0011833: Wand of Digging targeter on Barachi is too short. Description	 When firing wand of digging as Barachi the wand travels one tile farther than the targeter indicates. That is, the wand digs to edge of LOS, but the targeter sometimes stops one tile short of LOS but the wand digs all the way to the edge of LOS. I am having trouble determining what causes the bug with the targeter because it seems fine if the beam digs through no tiles, but I think the cause is when the wand digs through a tile and the tile at the edge of LOS is a wall that is not currently visible to the player but is within the barachi's LOS. Sometimes it doesn't happen though so I'm kind of confused. It seems like this is a directional thing. If you fire the targeter into an area in which you have direct line of sight for all 8 tiles, the targeter will be displayed for the entire length. If your line of sight to the edge of the 8-tile radius is blocked however, it works fine when targeted to the right or bottom of the screen (for me at least), but not when fired to the top or left of the screen. https://i.imgur.com/QLyNMw4.png [^] an image to more clearly show the bug. Top left shows targetter as expected, covering entire FOV to edge of vision. 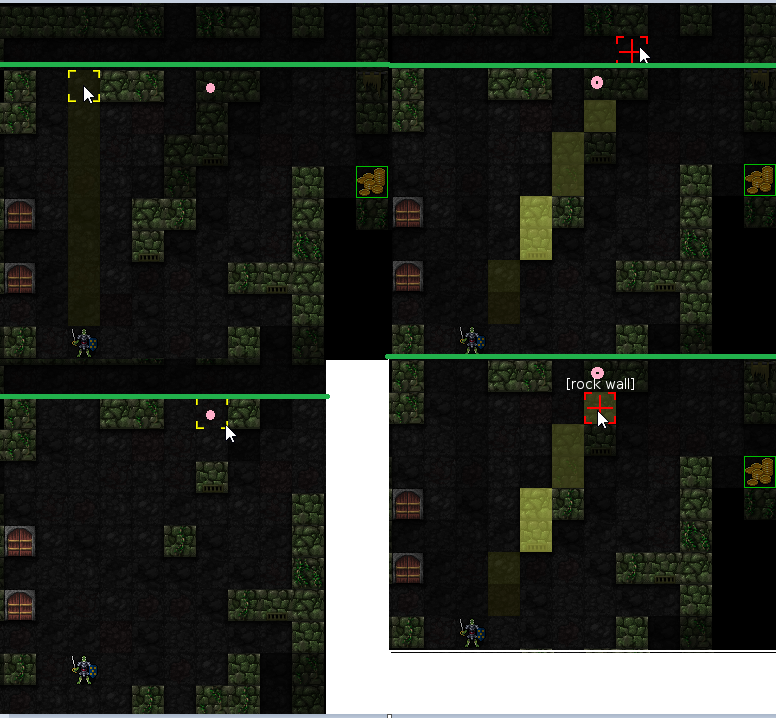 Top right shows targetter when aiming past the tile, where it is clearly not highlighted. Bottom left shows result of dig, with the tile gone as a result of the dig. Bug isn't present on non-barachi. I cannot reproduce this in 0.24-a0-41-gf098211c9e OS X console compiled with clang. When posting reproductions please include the exact version string of the build you used, platform, and build arguments, to help narrow the bug down. I tried to reproduce this locally on 0.24-a0-45-ga05850b26e. I found that I could not reproduce the issue on console, but with tiles the issue does occur. Changing '#define LOS_RADIUS 8' to '#define LOS_RADIUS 9' in defines.h (and no other changes) solves the issue. This isn't an acceptable solution but it might help narrow the bug down.